Balanced Literacy: What’s In A Name? 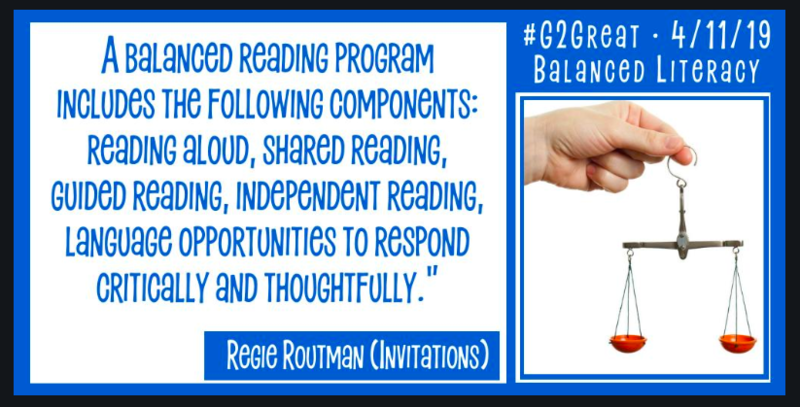 Thursday, April 11, #G2great hosted a Twitter chat entitled, Balanced Literacy: What’s in a Name? 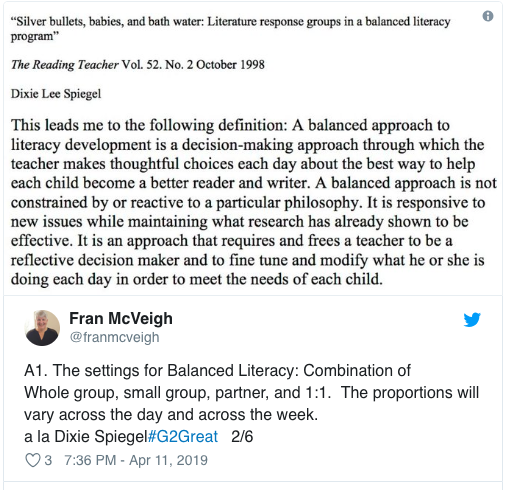 We had a powerful discussion around the balanced literacy framework with #g2great veterans and some first-timers as well. Let’s revisit the framework and some of the thoughts from the chat. Balanced literacy is a framework that delivers extended reading and writing support in varied environments within the classroom applying instructional methods that differ by level of teacher support and child control (Fountas and Pinnell, 1996). Through this framework “children are explicitly taught the relationship between letters and sounds in a systematic fashion, but they are being read to and reading interesting stories and writing at the same time” (Diegmueller, 1996). Originally, balanced literacy was focused on both a skills-based approach and a meaning-based approach in the literacy block. There is a renewed effort to include the systematic teaching of phonics along with a focus on comprehension–all within and around rich and meaningful literature-based experiences (Asselin, 1999). The optimal balanced literacy program consists of literacy events, such as read alouds, guided reading, shared reading and independent reading and writing (Fountas & Pinnell, 1996). Most recently, some educators have included book clubs as an integral part of the framework. It is important to note that a highly successful balanced literacy framework includes teacher directed instruction (direct instruction and modeling of skills, strategies, dispositions, procedures and processes by the teacher) along with student centered and student directed work. When planning, teachers can strategically design instruction, modeling and practice for students in each of the components listed above. For instance, when thinking about the practice readers need in applying knowledge of letters and sounds, it makes sense that the instruction and application would take place during the phonics, word study and spelling portion of the language arts block. But, in fact, it would also make sense to include quick instruction and group application in a day’s lesson included during shared reading. In addition, emerging patterns observed in benchmark assessment and progress monitoring are not only reserved for instruction during guided reading. Teachers can strategically plan to include modeling of the observed gaps during an interactive read aloud or the reading mini-lesson. 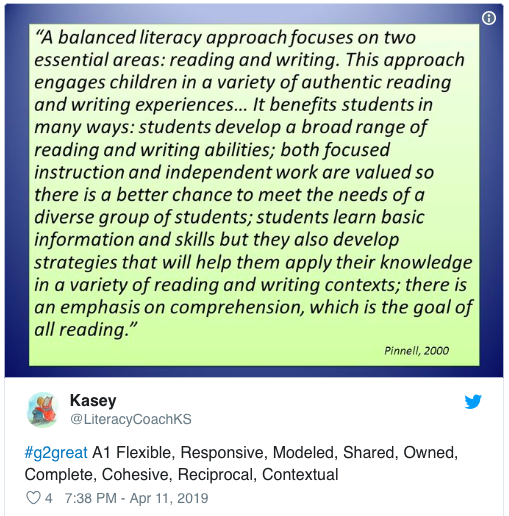 You can see that readers’ needs can be addressed through instruction and modeling in any or all of the components of a balanced literacy approach. A balanced literacy framework provides a system whereby instruction in reading and writing is delivered and supported in contexts that are connected and designed to meet student needs. It’s well worth our time to continue to learn and perfect the components and their interconnected systems to grow readers and writers in authentic ways.